Flexpak manufactures custom Railcar Covers for a wide audience of customers shipping by rail. As one of the most cost effective means of protecting lumber and wood products in the shipping process, the Railcar Covers manufactured at Flexpak are tailored to the needs and specifications of the customer. With a superior design in the industry, the Railcar Covers are manufactured to allow ease of application. When tested against other leading products in the industry, the Railcar Covers manufactured at Flexpak allowed an end-line shipping team to apply a cover by over 15 minutes faster than the competitor’s product. The Railcar Cover design as well as the printing options available make for an increasingly attractive option when shipping by rail. The sales department at Flexpak can work with your team to design an effective Railcar Cover that meets the load requirements and is customized to your particular team. Customizing sizing as well as developing a specific Railcar Cover print is of particular importance in Railcar Cover design. Please feel free to contact Flexpak at any point to discuss Railcar Cover potential, or to discuss packaging issues related to shipping by rail. A Railcar Cover from Flexpak is more than just a protective barrier against the elements and shipping process. The fact is, at a relatively low cost, a cover on a rail line pallet-set provides the perfect avenue for advertising. A printed Railcar Cover provides the means to communicate to a larger audience than other methods of packaging print. The large graphic capabilities that are possible with Railcar Covers makes them an excellent choice when shipping by rail. 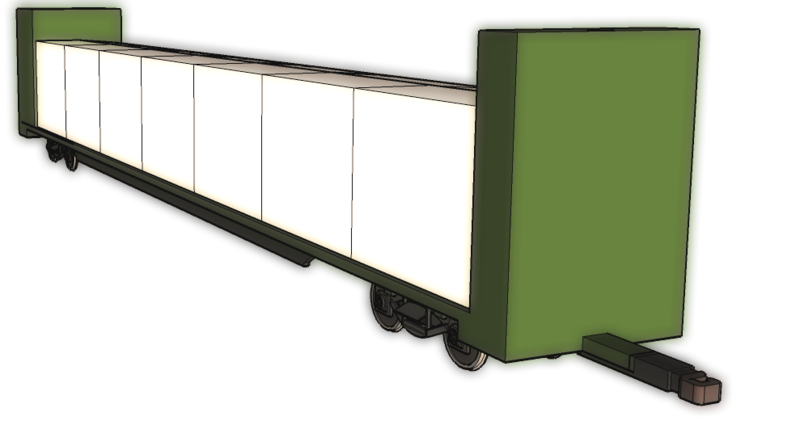 See the Printed Railcar page for more information.